I don't know about you, but one of my favorite parts about the weekend is the laziness that comes along with the free time. Even if you have plans - and I know this time of year, we ALL have weekend plans - it seems like everything's a lot more fluid than it is during the week. During the week, my mornings aren't rushed per se - I intentionally wake up super early to give myself plenty of time to prevent that - but they're definitely regimented. I wake up at the same time, my workouts are always between 30-50 minutes. I have breakfast at just about the same time every morning and leave the house at the same time, too. Like I said, not rushed, but definitely structured. Morning breakfast is usually fairly quick - a bowl of cereal or oatmeal, sometimes a bagel, always a cup of coffee. If I'm lucky, I get to read 10-15 pages of whatever book I'm currently reading; sometimes, I do some light housework - a quick load of dishes, or sweeping; sometimes, I have to sit down and pay some bills. On weekends, I love having a long, leisurely breakfast, where I can relax with my book and soak up two (!) cups of coffee. 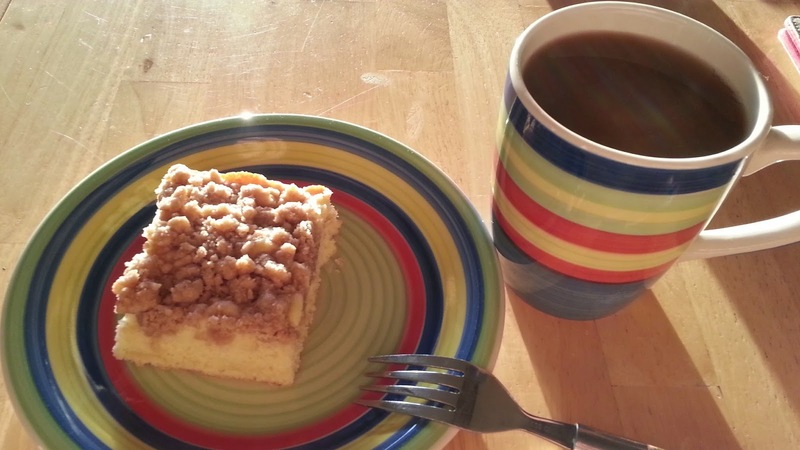 Every since I was a kid, coffee cake has been one of my favorite treats. For me, it's pretty much everything I want in a "treat" style breakfast. 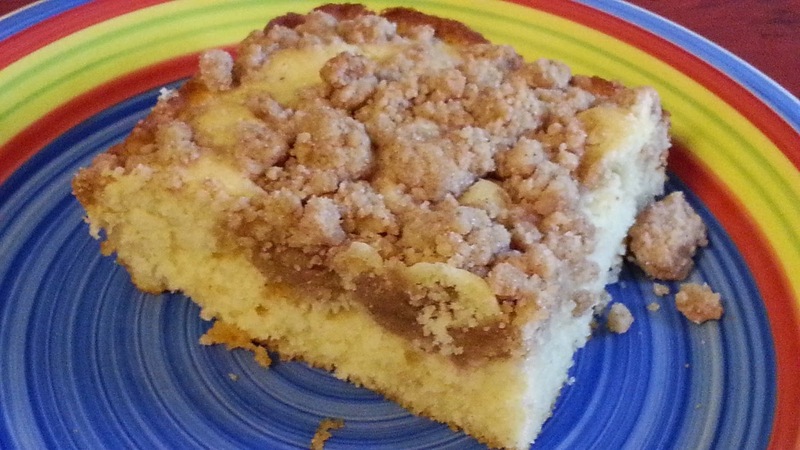 The topping is cinnamon-y and full of flavor; the cake is fluffy but flavorful, it's filling and delicious. I don't even know where I found this recipe, but I was so excited when I stumbled on it. I did have to make a few changes, which you'll see below. I didn't have cake flour, so I had to do some substituting with all-purpose flour and cornstarch. 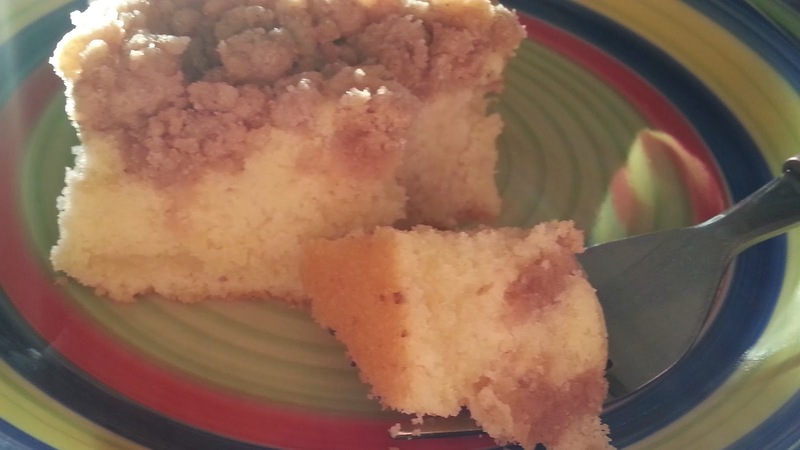 I've never use cake flour before and never had homemade coffee cake, so while I can't speak for how this compares, I know that both Joe and I were thrilled with how this came out. Joe's already asked me to make it again and he told me it's better than the store bought stuff, so I'm counting this one as a total win. 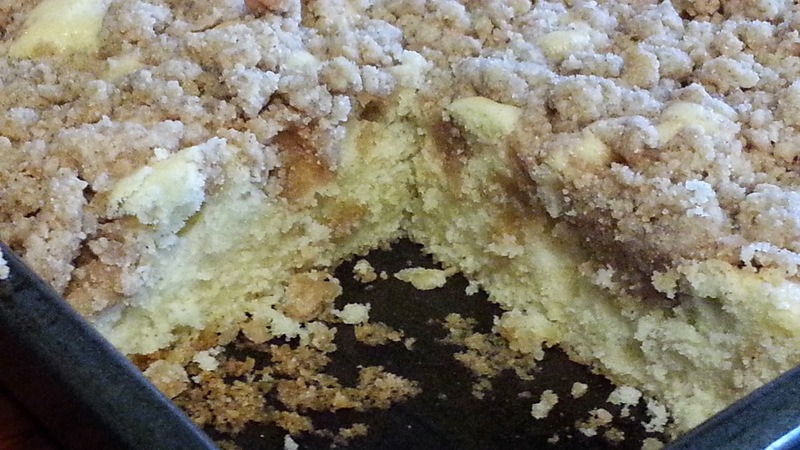 The streusel topping that the original recipe called gave me a TON left over. The recipe below is the halved version so you won't end up with leftovers. I stuck mine in the freezer and I'm thinking that it'll go perfectly on some muffins or an apple crumb pie. If you're looking for something special to bring to a holiday potluck or you want to make something special but quick for breakfast on Christmas morning, I think this is precisely what you're looking for. If you want to save time, you can definitely make this head of time, too. It's delicious straight out of the pan, but you can also pop it in the microwave for a few seconds to warm it back up, which will also give your kitchen that freshly-baked smell. Using a standard 1/4 size measuring cup, add 1/2 Tbsp cornstarch. Fill the remaining amount with all purpose flour. In a medium sized bowl, combine sugars, cinnamon and butter. Add flour and stir until mixture is crumbly with a thickness like cookie dough. Set aside to cool to room temperature while you make the cake. Preheat oven to 325°F. Grease an 8" square cake pan and set aside. In the bowl of a stand mixer fitted with the paddle attachment, combine the flour, sugar, and baking soda. Add the butter, one piece at a time. Continue beating until the mixture looks like wet sand, with no visible butter chunks remaining. Add egg, yolk, vanilla and buttermilk; beat until light and fluffy. Pour batter into prepared pan. Sprinkle topping evenly over cake. Bake until the crumb topping is golden and a toothpick inserted in the center comes out clean, 35-40 minutes. Let cool slightly before serving. Store tightly covered for about 5 days.